Catalan revolutionaries get ready for action to defend their revolution from Franco back in 1936. Barcelona at the time was famously described by George Orwell as ‘a town where the working class was in the saddle’. Now it’s Catalonia’s turn. Mahatma Gandhi once said, ‘First they ignore you, then they laugh at you, then they fight you, then you win.’ In many places it seems like ‘they’ are done laughing, and have started fighting. Perhaps the wave of growing repression that is spreading around the world can be taken as a compliment – movements are building power and can no longer be ignored or simply laughed off. In some ways it feels like politics is entering an exciting new terrain; in others, like it is repeating itself. Beneath the amusement-park facade of neoliberal Barcelona an invisible past has been blooming back into life. In 1919 the city abounded with anarchist unions and work-, housing- and food-co-operatives. They even printed their own coins. A 100,000 person strong general strike won workers an eight-hour working day and the right to unionize. During 1936-37, the co-operativist spirit of the city mobilized against Franco’s military coup, with autonomous neighbourhood assemblies collectively digging air-raid bunkers and organizing food distribution. Local militias were set up to ensure security after the city had expelled its police force. Catalonia saw collectivization of most of its factories and land, raising production as well as morale. Such anti-capitalism scared the West. 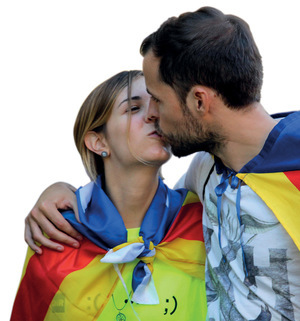 It seemed that Catalonia had gone beyond the allowable scope of change. Catalonia became isolated – with Western powers refusing to provide arms, banks declining loans and businesses blacklisting collectivized factories. When Italian planes, in aid of Franco, dropped bombs on the collectively dug bunkers of Barcelona they were fuelled by gasoline originating from the oil fields of Texas. Catalonia fell under a 40-year fascist dictatorship. But the past is alive today. On 1 October this year, it was some of the same neighbourhood assemblies that had once dug air-raid bunkers that barricaded themselves into polling stations to protect the Catalan Referendum. During the Franco years, these movements continued the below-the-surface work of transformative social and cultural change. Now the co-operativist spirit of Catalonia is rebounding. Barcelona’s mayor Ada Colau is feminizing politics and trying to overcome polarization and the macho brinkmanship of Puigdemont and Rajoy. The economic crisis of 2008 that sparked the 15-million-strong indignados movement across Spain also drew people into Catalan co-operative projects. As the individualism stoked by a once-booming economy began to crumble, it gave way to more mutualist alternatives. Social movements pointed ‘up’ to the banks and political corruption to establish blame for the crash, rather than ‘across’ to immigrants or other scapegoats. In Catalonia massive protests rapidly turned practical, paving the way for a surge in projects to meet people’s basic needs. Today Catalonia is awash with co-operative projects that have been building a powerful infrastructure run by users and workers. Som Energia is a renewable energy co-operative founded in 2010 with 36,500 members and 55,000 contracts. It is transitioning from being an energy distributor to being a producer, placing solar panels on the roofs of its own users and offering incentivized saving bonds for its members to invest in the network. Guifi.net describes itself as ‘a bottom-up, citizenship-driven technological, social and economic project with the objective of creating a free, open and neutral telecommunications network based on a commons model’. It is building a decentralized wireless internet network across Catalonia. The multi-faceted Cooperativa Integral Catalana involves tens of thousands in user-based economies and currencies with hubs across the region. The Network for Energy Sovereignty is launching a campaign to buy back Barcelona’s electrical grid, while the city itself has been replacing century-long corporate control with a public municipal water system. To confront the housing crisis – a consequence of the 2008 housing bubble now compounded by rampant tourism – a renters’ union has been formed. And there is a large platform for those squeezed by mortgages to band together to keep their houses. This past year saw the launch of Coopolis – a new piece of movement infrastructure to support fledgling co-operative projects as a kind of ‘laboratory for inter-cooperation’. It is based inside Can Battio, a once-abandoned factory, now run by a local neighborhood assembly. The factory floor is crammed with self-organized production projects. Across Catalonia there is a real potential for such alternatives to scale up to challenge the existing corporate model. And it’s not just Catalonia – across Spain a co-operativist movement is rejecting the limitations of confronting power by choosing instead to remake it. The focus is participatory municipalism – dedicated to opening up exclusivist urban political processes. Insurgent parties now run local governments in Madrid, Barcelona, Zaragoza, Valencia, La Coruña and many other centres. Catalan independence supporters in Barcelona. The city of Barcelona has not been governed by the party of ousted centre-Right nationalist Carles Puigdemont. It is governed instead by a citizen platform called Barcelona en Comú which draws part of its structure from the same neighbourhood assemblies used to mobilize against the fascists in 1936 and 1937. These participatory platforms allow neighbourhood and ‘issue’ working groups to develop political positions on key issues such as education, housing, and ecology. Barcelona en Comú facilitates decentralized rather than monopolized decision-making. Most neighbourhood platforms have a deep commitment to feminizing politics and creating collaborative rather than competitive spaces. This approach has proved critical in trying to overcome the macho brinkmanship of Puigdemont and Spanish prime minister Mariano Rajoy, following the October independence referendum. 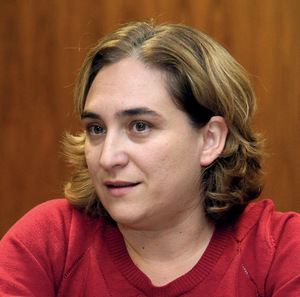 Barcelona’s first woman mayor Ada Colau convened a special meeting of diverse actors to develop a mediation process to ease the anti-negotiation polarization. A commitment to feminizing politics involves reinventing the entire participatory process. 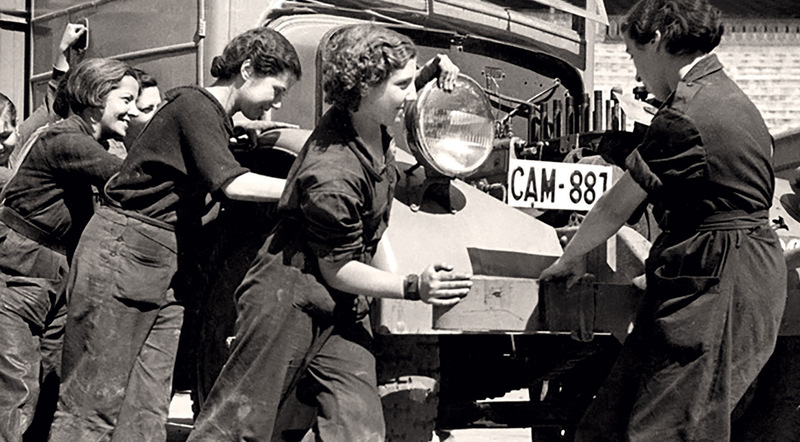 In its general assemblies, Barcelona en Comú alternates speaking opportunities between men and women and every commission must have at least half female leadership. The majority of us now live in urban environments but we do so on an increasingly unstable planet. We must come together to effectively tackle this global climate crisis. But efforts to recreate power inevitably provoke status quo resistance – as witnessed on 1 October as the Spanish state launched an assault against unarmed Catalans waiting to vote in the independence referendum. Like so many times before, the people of Catalonia took to the streets with the simple message: ‘We are not afraid.’ It is not just bravery but the stubborn determination of Catalans to use their little part of our besieged globe to build liveable alternatives. It is this that earns them our gratitude and support. Kevin Buckland is a Barcelona-based activist and storyteller who works to cultivate cultural change in the age of the climate crisis.